Maybe these trends are related, but whether they are or not, it is clear that we live in an age when faith is being tested and Christianity’s truths are being questioned. Congregations are not necessarily pressuring their pastors/preachers to resign their jobs (that is, vacate their positions). Rather, as MacDonald put it, they are pressuring pulpit ministers to change their approaches. And yet such is the nature of these desired changes, that the prospect of those changes themselves are causing the ministers to feel stress and burnout. Yes, ministers are working more hours. Research has indicated that. But, as MacDonald argued, the greater stress for the ministry is not additional hours but rather those changes that are sought by the congregation itself, or by its eldership/leadership. MacDonald stated that he had faced similar pressures himself. For the full text of that New York Times article, click here. I’d have to say I agree with MacDonald about the nature of the dilemma. It’s where he suggested a remedy that I begin to disagree. I have no argument with the idea of “saving souls.” That’s what the church is meant to do. That is its highest calling. But what about this business about “elevating people’s values and desires”? Allow me to interject a different approach. The church exists to help people achieve eternal life. If “elevating people’s values and desires” means lifting their gaze from this world to the next one, from earthly life to heavenly life, then yes, that works, and I have no problem with it. But I suspect that more was meant here by “values and desires” than the idea of gaining eternal life. I readily admit that Christianity offers blessings for believers on this side of the grave. It also offers trials and tribulations. I raise these issues because I see so much focus on the here-and-now in modern religion. If there is any common ingredient in what we see in Christendom that might be called misdirected or problematical, it falls into the category of a too-heavy emphasis on what Christianity does for someone on this side of the grave. There are different names for this. A “health-and-wealth gospel.” A “prosperity doctrine.” Or a “social gospel,” as in an emphasis on what Christianity does for a person in his business life, family life, contemplative life, or civic life. In a recent post on this site, I defended the work of a believer and patriot named Jon McNaughton. McNaughton’s painting One Nation Under God, a sublimely patriotic historical tableau that honors the influence of Christianity on the framers of the U.S. Constitution, has drawn huge praise and harsh condemnation. A Youtube video of his creation of the work pulled more than 3 million hits and thousands of comments. But a particularly vehement attack called out for rebuttal, and so I wrote a piece that has since become the most-trafficked of all my postings thus far. In that piece, I argued against the currently popular theme known as “social justice,” and I argued against it for reasons I will share below—mainly, that Christianity is foremost a vehicle for eternal life, not (mainly) for social change. (To view that posting, click here.) We might not be able to change this world. This world will never be right. But we can help ourselves, and others, reach the next world. And that world will not have the problems that this one will never escape. Through all of this, we have said nothing of the issue of political correctness. I read an interesting treatment of that issue in the May edition of Rocky Mountain Christian. 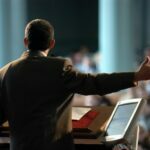 Therein, minister Guy Orbison, Jr., in a column entitled “The Offensive Word,” laid down a challenge for ministers everywhere. As Orbison observed, sometimes when Jesus spoke, people were offended. Sometimes that is necessary. Even from our pulpits. And yet Lewis’s conclusion is that these two motive forces, taken in tandem, prod us onward as Christians. If the world were full of nothing but pleasures, then hardly anyone would feel any compulsion to seek anything different from life as we know it on earth. We would have such complacency that the idea of diligently seeking God might feel too strenuous, or too unpressing, for us to concern ourselves with. Same, too, with the idea of discomforts, but in reverse fashion. If our pains are too unrelenting or too severe—if life, such as we have known it, is something dreadful or deplorable—then where is there any desire for an endless (as in eternal) extension of life? We would rather just reach the end of this life we know, and be done with the business. But another thing that hardships do for us is that they teach the believer that he does not want to find his comforts here in this world, for he will never be completely at ease here, no matter how healthy he may be, no matter how glorious his earthly Christian fellowship may be. It will never be perfect. And so he must soldier on, for something better awaits. His motivations, taken together, always nudge him in the right direction. That direction is eternity. It is worth noticing that each of these motives—earthly goodness and earthly badness, temporal pleasure and temporal discomfort—prod us on to something else that is neither of these things. They motivate us, as Christians, to eternity, and it is only in eternity that we will truly find what we are seeking. That was Lewis’s point, and I think it is well considered. Too often today, individuals seeking to build followings of believers play the “health and wealth” card, or make some similar appeal. And they do so because they are shrewd observers of human nature. The average human being is prone to succumb to appeals directed to his creature comforts. He wants to be wealthier. He wants to have better health. To be at ease. Then, too, there are weightier issues. He wants to break the grip of drugs or abuse or some other grim issue. How are we to answer that? We cannot fault someone for wanting to make his or her temporal existence a better one. The fault comes in making those matters the main thrust of Christianity. And it is here that I suspect that the real pressures are brought to bear upon Christian ministers. In asking ministers to make their appeals more “relevant,” or in seeking to “reach people where they are,” we are only pressing them to appeal to lowest common denominators, and those denominators will revolve around providing social fixes for their hearers, or solutions to earth-bound troubles (dire though they may be), or providing entertainment for church-goers, or extending other promises of benefits in this earthly, biological life we know now. Again, I will not argue that there can be blessings along the way, and that these can have their appeal. But I hope that people will recognize that when we focus on the temporal, here-and-now, this-world blessings of being a Christian, we are looking at half-truths, and half-truths, while they have at least some truth in them, can be problematical matters. I am an admirer of the early (19th century) Restorationist preachers, and I once read those pioneer preachers were known for preaching eternity. I have always prized that thought. It has helped me to keep a focus in my own studies and my own Christian walk.